I was first inspired to paint cows when walking through a field at the foot of Cam Peak in Gloucestershire in the south west of England. On a sunny but chilly day I was admiring the beautiful hedge-lined countryside with my family who had wandered a little away from me. When I turned around I was faced with a sizeable herd of Friesian or Holstein cows walking towards me. I took out my camera a fired off some photos as the black and white patchwork quilt of cattle ambled their way closer and closer. No aggression here you understand, simply curiosity combined with perhaps hunger...pretty sure these were the normal style of cows i.e. herbivore! Anyway, the movement, interaction and expressions on the faces of these animals really struck a chord with me and it became apparent that much of what I found fascinating when painting people was also present when observing animals (no disrespect to any portrait sitters intended!). The first cow painting to come out of my experience with the cattle of Cam Peak was 'Who Are You?'. This is also, I think, the first narrow painting I produced and this relatively unusual aspect ratio is one I've enjoyed returning to over the years. The lead cow peers out of the canvas at the viewer while a couple of other members of the herd are suggested in less detail. The scenery is actually inspired by the view across some rolling hills from the edge of the road on the way to Dartmouth in Devon. Cow painting - Who Are You? I’d always been slightly reticent about working from photographs but this painting made me realise that I could produce work in my painted-from-life-style providing I tapped into the mindset I have when painting from life. The way I do this is to display the photo on the computer screen and then place the computer between 6 and 15 feet away from me as I paint at my easel. This encourages me to ignore the detail in the image and work in the same way I would if a real cow was in front of me, off at a distance. I used a different section of the same photo to create ‘Morning Walk’ next. Like the previous picture, this cow painting was created with acrylic paint using gloss medium to add some translucency to each layer of colour. It was the creation of this image with its clear blue sky above a bustling quartet of Friesians that made me really fall in love with painting this subject. The sense of movement that I feel comes across is in part due to the loose and expressive brush strokes used, especially with the 3 cows on the left. In addition, I found that using blues where one would normally expect to see blacks or browns gives the image a vibrant look that was in keeping with the reflected light I used to enjoy painting when depicting flesh tones. My bovine acquaintances were not yet done providing me with pictorial inspiration as I used another photo of the same herd as reference for ‘You Again?!’. This is a large (about 40” x 30”) painting on canvas of a group of Friesians, again with hues of blue, this time within the Gloucestershire fields (the background is inspired by a view from Cam Peak). Another key step in the production of this cow painting was the use of interactive acrylic paints from Chroma Inc. These acrylics are great as once dry they can be reactivated by spraying them water. This can be done repeatedly and allows the paint to be readily blended. At the time this was a revelation to me and now, some 6 years later, looking at the blending of deep blue on the group of cows on the right genuinely brings a smile to my face because it records a moment in time when I discovered a whole new level of artistic technique. (I should point out that I’m very aware that blending paint is anything but new, but the ability to do so without long drying times or solvents was, to me at least, brand new at this time). 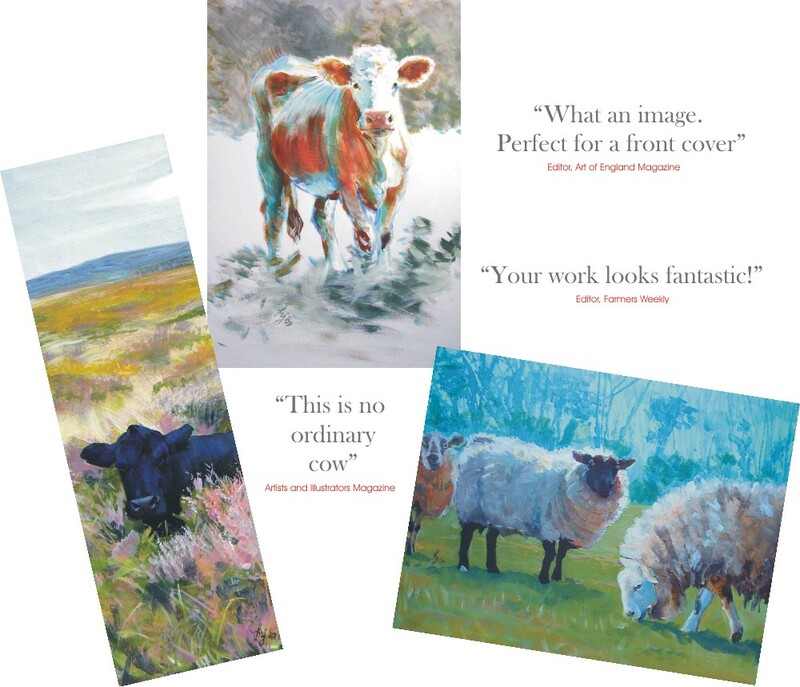 After these paintings I started carrying a camera with me often and whenever I saw a herd of cows in a field whilst on my travels I would park the car, hop a gate, climb a tree etc in order to get a few shots. that overlooks a valley with rolling hedge-lined fields. Once again, blue plays a key part in this image, for one the reflected light on the cattle but more unusually in the colour of the background fields. I think my favourite part is the cast shadow on the right-hand cow, painted in purples, for some reason my eye is always drawn to this area. This painting started with loose gestural brush strokes using cerulean blue acrylic,some of which can still be seen in the finished cow. Next broad strokes of a deep orangey red brown established the source of light and gave a sense of form. The lighter areas were then filled in with a paler version of the blue used earlier taking particular care to convey a sense of the curved surfaces with each brush stroke. The cow was finished by adding thick white highlights on the head and ears. The background and foreground plants were both established with loose dry brush work which helps keep one's focus on the more-detailed cow. The finished cow painting is one of my favourite pictures and has proved very popular over the years. One of the next cow paintings I tackled was inspired by a calf in a field that borders one of the many maze-like, hedge-lined lanes near Silverton. The calf in this painting 'Come On, Keep Up' is looking back over its shoulder towards the viewer and wasn't quite as orange as it appears in the painting but I love enhancing the colours in nature and I think the orange here really adds to the sense of a sunny summer's day. 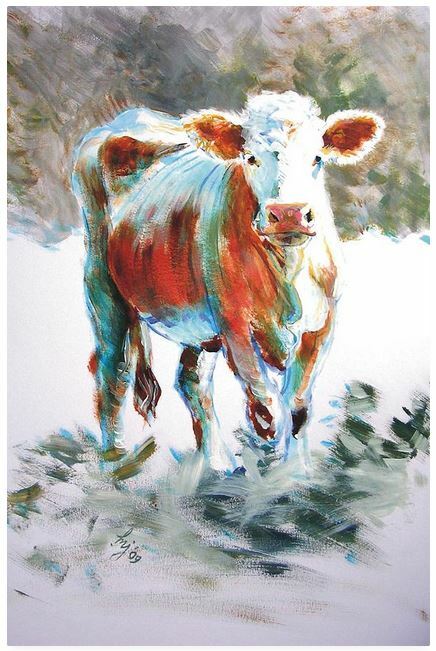 The painting of the cow also really demonstrates how the Atelier interactive acrylics allow effects to be achieved that wouldn't be easily done with conventional acrylics. contrast of texture. This has also proved to be a popular cow painting. in that they have a single white stripe around their otherwise black bodies. These animals, so striking in appearance, can make for some dramatic cow paintings. "Three Girls and Heather" - Jet black angus cattle together in a group of three, depicted in deep ocean blues, while standing in a patch of purple heather and yellow gorse. Eerie light catches the otherworldly landscape that is Dartmoor in Devon, distant hills loom in the background. Vibrant and slightly surreal this painting depicts farm animals in a realistic but unique way. This is a colourful and striking cow painting. A belted galloway cow all fluffy in the wind stands on Dartmoor in Devon in England and senses that it's about to rain. In the distance, two other belties graze and stand under a dark, pink and moody sky. The belted galloways have a distinctive single white stripe around their middle which make them great subjects for cow paintings. 'Storm's Coming' - painted using Atelier interactive acrylic over and under painting of conventional acrylics this expressive and dramatic painting depicts a tan coloured belted galloway cow standing under a colourful cloudy sky. The cow was discovered in a field in Richmond Upon Thames while the sky is inspired by a view from a hill top across the valley of the River Exe in Devon, England. The colours and brushstrokes used on the farm animal mimic those used in the sky creating a sense that the animal is very much a part of the same world, ever-changing, ever-moving. An impressionist style painting of a cow. 'Feel The Heat' is a painting inspired by some cattle grazing in the field next to the footpath as one arrives at the Turf Locks pub near Exeter in Devon, England. I've departed from my usual techniques here in order to explore some different ideas and textures. The sky was created using watercolour pen and then I applied a damp brush to create a wash, texture was added to this area by repeatedly placing a paper towel on the damp paint. A similar technique was used for the cows and grass. Some defining, gestural lines were added to the cows and some tree included to add a sense of depth. The finished piece is atmospheric and the different textures and lines draw the eye deeper into the picture with continued observation. I plan on incorporating these techniques into future work, perhaps in a small area or particular section of the composition. The Exeter area has plenty of inspiration for painting cows. Misty Moor' depicts five cows wandering free on Dartmoor among the ferns and long grass with majestic hills in the distance. Dartmoor cows painting inspired by the Devonian environment. ﻿﻿'We've Come Home' An original framed acrylic cow painting on board of part of the herd of cattle returning home after a long day in the field. The scene depicts distant hills and hedge lined fields behind a tangled hedgerow. We Have a Visitor' A young calf in a Devon (United Kingdom) field sees a visitor coming but his mother hasn't noticed yet! Painting of a cow lying down with a calf standing by her side. 'Food and Shelter' - A young calf sheltering by its mother while enjoying grazing on some fresh green grass in a Devon field this is an impresionist style cow and calf painting. This mixed media painting is 'Chit Chat' A couple of cows having a chat in a field in Branscombe in Devon United Kingdom. Belted galloway cows make a great subject for cow paintings. First off all this breed of cattle has a really unique and distinctive look, the cows are typically completely black except for one wide, white stripe that completely encircles their middle. There is also a less common version which is brown and white. Often fluffy or shaggy coated these cows are great for artists who like to depict texture in their paintings. Local to Devon, herds of belties as they are affectionately known are often found roaming wild and free up on the windswept but beautiful heights of Dartmoor National Park. Here, the stark black and white cattle contrast nicely with the lush greens, browns, oranges, yellow, pinks, blues and purples that comprise the colorful pallette of the Devon landscape at its most dramatic as the moorland is peppered with ferns, giant rocky outcrops known as Tors, gorse and heathers.